Like its fleetmates, Amaryllis is an all-inclusive product; wines, soft drinks, bottled water, beer, liquor and liqueurs are part of the fare. Shore excursions are also part of the package, and a VW mini-bus follows the barge’s route and is available at designated times for transport to daily tours. 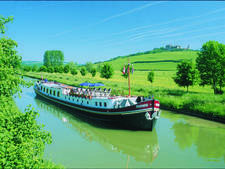 Typical excursions include a wine tasting at Beaune, the wine capital of Burgundy, and a tour of Château de Germolles, residence of the Dukes of Burgundy. There are four suites decorated in a traditional style, complimented by occasional tables from Li Puma of Florence. The specially designed window casings incorporate huge windows that frame the passing countryside. The sun deck features loungers and a small heated swimming pool. The ship also carries eight bicycles. 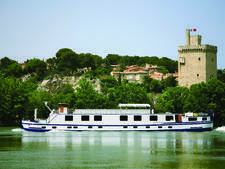 The barge has a crew of 6, including the captain, two hosts, chef, tour guide and sailor. 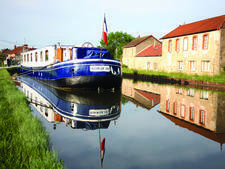 Editor's Note: Amaryllis is only available to groups or families wishing to charter the whole barge. 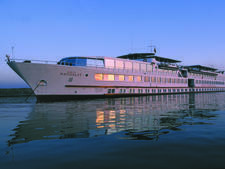 The eight-passenger Hirondelle hotel river barge cruises in Southern Burgundy and Franche-Comte, France, a region known for its vineyards.